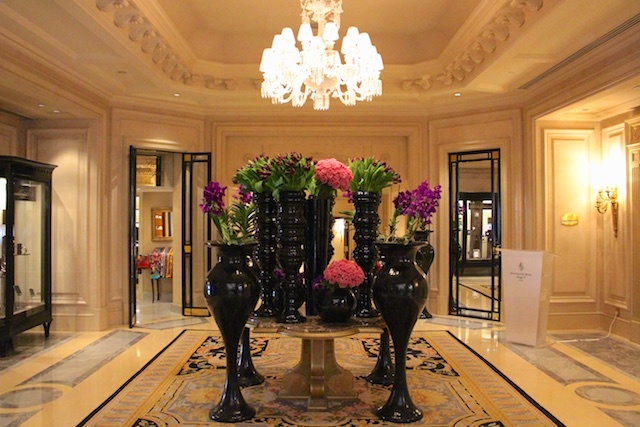 The Four Seasons has a fascinating history. When I first arrived in Toronto in the early 1980’s the destination hotel to stay, have a drink or be seen at was the Four Seasons in Yorkville. Hand-poured Martinis in the Avenue Bar, dinner at Truffles, the limos pulling up from Avenue Road, us speculating which legendary star would descend for a Festival of Festivals premiere (as tiff was known then), all part of the impressive and famous Four Seasons ‘white glove’ experience. Over one of those fabulous, 80’s ‘smart marts’, I remember being told of her humble beginnings. It should come as no surprise that the Four Seasons has a long history of providing firsts in luxuries, conveniences and services for its clientele. In fact, today’s understanding of what luxury and top-notch service is all started with the original Four Seasons concept. A young architect, and Canadian businessman Isadore Sharp, attempting to grow his career and working for his father, founded his new business in 1960 and designed a motel for a family friend, ultimately inspiring him to create his own hotel in Toronto. Opened in the spring of 1961, the Four Seasons Motor Hotel at 415 Jarvis Street launched the Four Seasons empire of luxury hotels as we know it today. Enjoy some luxury with these Four Seasons favourites of followsummer’s. In June of 2015, Café Boulud in the Four Seasons Toronto closed its doors for a major design and menu retrofit. Reviews and the general word on the street had been positive, but frankly, they just did not seem to be pulling a loyal crowd. 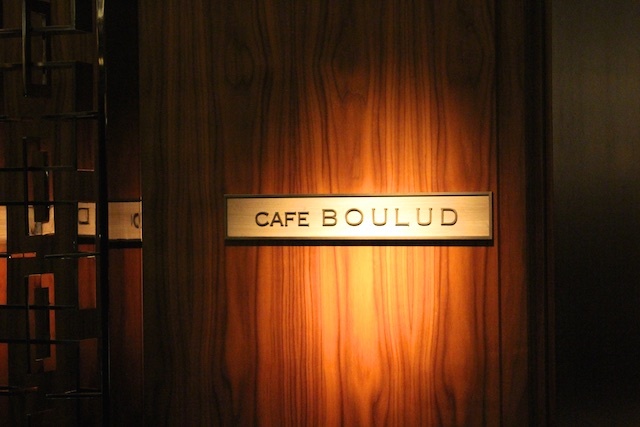 I must admit being disappointed with my several visits to Café Boulud. The food was beautiful, the service stellar but I never felt entirely comfortable in the room. Those out of date, stark, pop art posters stealing focus from that admirable food and worthy service. The room itself did not live up to the crisp, classic, clean lines made famous by the Four Seasons brand. And the food didn’t seem that French to me either. Fancy foams and risottos? Mon Dieu! After a whirlwind seven-week, 2 million dollar renovation, Café Boulud was reborn and rejuvenated with a fresh new look and brand new and very French menu. “I think the restaurant called for a friendlier atmosphere,” says Chef Daniel Boulud; “We wanted Café Boulud seen as a modern French bistro, in the style of so many of the great cafés of Paris and Lyon.” And indeed, Café Boulud now feels and tastes like many of the French bistros we have come to love. A boisterous, familiar, engaging room, it’s attendees enjoy some excellent French bistro food, some good wine and each other’s gossipy catching up. One need only travel to Yorkville for a little taste of Lyon. served in the sumptuous splendour of the Four Seasons George V . Don’t let the address throw you off your quest for a little pampering and experiencing lux Paris. Make your reservation, shine your shoes, put on a jacket or perhaps a hat, and enjoy this truly unique experience in style. Indulge your luxuriant side in Four Seasons serenity with their renowned service, opulent surroundings and white glove attention. The heart and soul of the George V truly beats in La Galerie, showcasing beautiful 19th-century paintings and furniture, magnificent Flemish tapestries, and ornate clocks that were originally made for Versailles and is the perfect setting for your Lux Afternoon Tea experience, all impeccably timed and smoothly serenaded by some baby grand accompaniment. La Galerie also offers fantastic beautiful people watching: the stylish, suited power-brokers in the fountain-fed courtyard, the lunching ladies, wrapped in their stoles and pashminas. In summer, enjoy lunch, dinner or a couple of cocktails in sunny-sun or romantic moonlight in their busy courtyard. Champagne and tea drunk, our afternoon lingers well past five o’clock as we lounge in our comfy Louis XVI chairs and continue our opulent Four Seasons Lux experience enjoying Artistic Director Jeff Leatham‘s beautiful, bold and breathtaking floral arrangements which adorn the lobbies of the George V. We feel utterly spoiled. And luxurious. And of course, steeped in all things tea: high, low, afternoon or in between. And as always, luxuriously Four Seasons. Probably the most exclusive family resort in Morocco, The Four Seasons Resorts and Private Residences is located just minutes outside the Medina on the edge of Hivernage and overlooking the Royal Menara Gardens. 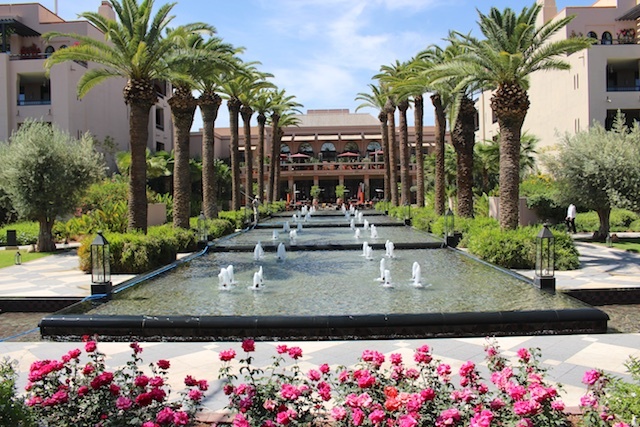 “The heart of the Red City” opens up to reveal an Arizona-like resort oasis that brings together the best of Moroccan architecture with the classic, clean lines the Four Seasons is famous for. Completely different from her other sister Lux properties in Marrakech, the Four Seasons Resorts indulges you with a stately, modern feel, offering a gentle nod to its Moroccan place in history. Faithful to the Four Seasons brand, the resort offers stylish, sun-lit public spaces, bathed in beige and accented with an occasional hotshot of colour. Indulge your senses in the bright, crisp principal rooms, given bold colour splashes from the exquisite florals that dot the lobbies, bars and main spaces of the property and that have become a signature statement of the global Four Season’s chain. Light filled public rooms, modern service-oriented staff, and with 24-hour Concierge options, the Four Seasons offers an assured level of luxury set amid 40 acres of extravagantly landscaped Moorish gardens, a place where you can spend extended time relaxing. Close enough to the medina and the haunting sound of the muezzin’s call to prayer but just far enough away from the hustle and bustle of Djemaa El-Fna. Situated in prime London real estate and surrounded by the greenery of Mayfair, The Four Seasons London at Park Lane received a complete refresh and refurbishment by renowned designer Pierre-Yves Rochon in 2011 and in true London and Royal fashion, crowned with a beautiful oak and stone rooftop spa and fitness center: a total sanctuary with floor to ceiling glass treatment rooms, water sculptures, and spectacular views over green and leafy Hyde Park. Stay in ‘The Blue’ – a beautiful one-of-a-kind suite featuring a striking blue colour scheme enhanced with marble and beige limestone. The eighth-floor suite offers incredible panoramic vistas overlooking Hyde Park and Park Lane, ideal for en-suite entertaining! 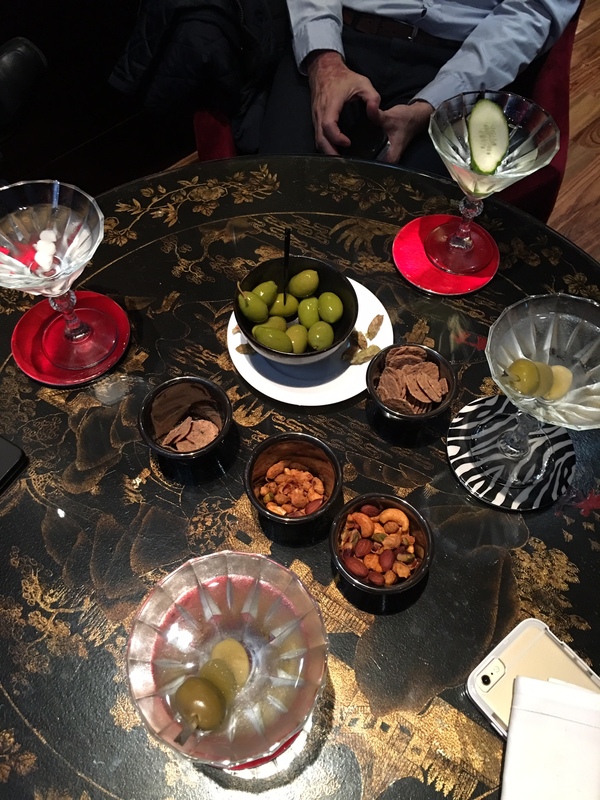 Or enjoy hand-poured martinis (we sure did!) in the smart and clubby Amaranto Lounge and Bar showcasing a trio of inter-connecting spaces: atrium, lounge, and conservatory close to Hyde Park on Park Lane and featuring an all-day Italian inspired dining menu and bar snacks. Consider their Traditional English or Vegetarian Afternoon Tea snuggled close to the fire for those damp, London days. Or staying true to Amaranto’s theme, London’s first Italian Tea. Next on our Four Seasons wish list? The newly opened (on a private island!) Four Season’s Lanai Hawaii. In the high Sonoran desert, the Four Seasons Scottsdale at Troon North and the Four Seasons Tented Camp Golden Triangle in Thailand. Or perhaps a stay at several Four Seasons destinations and experiencing a lifetime’s worth of adventure in one spectacular voyage on the Four Seasons private jet. Wishing. A long, long way from her humble beginnings, 55 years ago on not quite such a luxurious stretch of Jarvis Street in Toronto, Canada. Four Seasons well, my friends!